After a busy morning attending the Gluten-Free for Cincinnati Expo and visiting grocery wonderland Jungle Jim's (see that recap here), my mom and I were hungry, but could not really articulate what we were hungry for. After all the carb and sugar-heavy fare at the expo l knew I wanted real food, so I turned to my Find Me Gluten-Free app to see what peaked my interest. From the list of local restaurants, Mazunte caught my eye, which a Mexican taqueria located in the Madisonville neighborhood of Cincinnati. 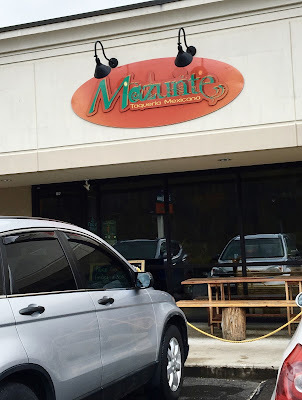 With glowing reviews, and an opportunity to get one of my favorite foods- tacos- I knew that Mazunte would be a perfect stop on the drizzly, dreary day. What's cool about Mazunte is that it was founded on the belief that Mexican food is so much more than the bland, apathetic tacos found at "Tex Mex" places. In was fresh ingredients and bold flavors and out was sub-par ingredients and an uninspired menu. Arriving to the restaurant after noon, a moderate crowd was already assembled, hinting that Mazunte really is the real deal. 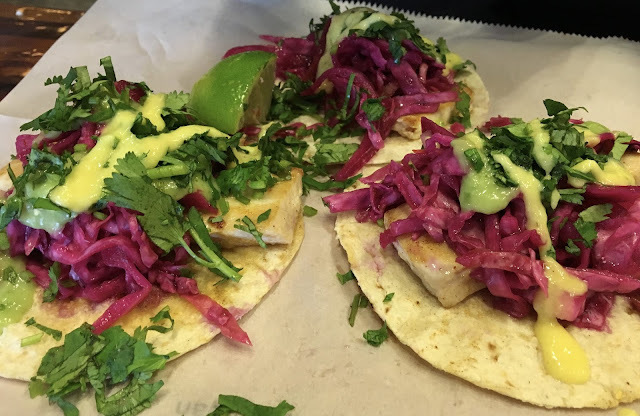 Because I have extensively reviewed taco restaurants in recent months, I couldn't wait to see where Mazunte measured up. When I stepped up to order, the staff member who was helping me let me know that everything was gluten-free save for the fried items, which are made in a shared fryer with gluten-containing items. That means chips are off limits for celiacs and medically restricted diners. That aside, the menu has a ton of delicious-sounding options, and I found myself torn between tacos and tamales. Dairy is few and far between, but look out for crema and queso fresco. I ended up going for the shredded chicken tacos, which come topped with cilantro, avocado salsa, onions, and smoked red salsa. The first thing I noticed when they came out was that each tortillas was loaded with toppings. So much so that it was hard to wrap the tacos! I ended up paring down some of the toppings them with a fork, as to minimize the mess. I loved the tender, spicy chicken which was clearly pulled, and oh, so succulent. The onion and cilantro added fresh flavor, while the guac added creaminess that was a nice textural contest. The smoked salsa, which clear hints of smokiness, did not knock it out of the park for me, but it was not bad by any measure, just not my favorite. Overall though, these tacos earned a solid two thumbs up from me. My mom ordered fish tacos, which she loved. As with mine, she liked the fresh flavors and textural contrast, but also noted how the abundance of toppings made eating the tacos quite messy. No complaints however from both of us! The only suggestion I'd make would be to double-wrap the tacos with a dual layer of tacos. Mazunte was a great find that really came through. Being in an unfamiliar city can be stressful when you don't know which restaurants are safe to eat at, but thanks to Find Me Gluten-Free and the guidance of locals, I was able to "discover" this unexpected gem of a restaurant. Mazunte offers delicious food, reasonable prices, and perfect portions, all in an environment that has a cool vibe. I definitely would make a repeat visit if I was ever in the area. Sounds delish! I love mexican food, but have discovered that sometimes I have been glutened by the seasoning on the meat. Can you clarify if their seasoning that they use on the meat is also gluten free? Thanks!